A long trip to Wolverhampton proved fruitful for the Rugby Town Juniors Youth, hoping to reach their second final in consecutive seasons. They again put in an impressive performance to ease through to the next round. A flat pitch greeted the team and Town got straight in from the off, creating numerous chances for the opening goal. However it was Khalsa who should have gone ahead after a mistake by the Rugby defence, their striker shooting wide. Town upped their game and scored two within two minutes, with both beating the Khalsa offside trap, and Jac Redhead benefiting from both through balls. The Town players proceeded to score more goals as the Khalsa defence stood still waiting for a flag that never came. Jordon Idedevabo on 20 mins scored Towns third, powering his way through to shoot home, and the ever impressive and improving Jake Warmington scored the fourth after some good play by Bayley Pollard. As half time approached Jac Redhead’s excellent first half performance earned him a first half hat–trick (again unmarked in the area) to sweep home from a Luke Jones cross. The second half was a non-event really, but recognition should be made of the outstanding Jamie Thornton in the Rugby goal, along with the cool and composed Will Harris. Substitutes Harry Cook and Husama Norma added to the score line to see Town ease through to the next round. 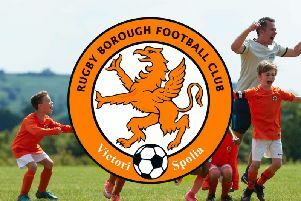 Juniors Youth (Orange) gained more momentum in their quest for a second premier title in two years with a comprehensive victory over their local rivals who play in blue. Town put a young side out, and started nervously but it was the blue side who had the best of the early exchanges. That all changed on 15 minutes when Ed Brogden an found space in the area to slot the first home, and within the next 10 minutes the Orange side scored another two; Ed Brogan sweeping home an excellent move down the left and then the classy Jake Vousden who along with Bayley Pollard (c) running the midfield show all game, weaving through a couple of tackles and slotted the third home. The ball bouncing over the Blue keeper. There was time for one more in a one sided first half, with Vousden again the provider to Ed Brogan, totally unmarked in the middle, and he finished well. The second half was much the same and although the Blues never gave up the Orange side piled the pressure on creating chance after chance. Goals again flowed with substitute Jac Redhead scoring two, both goals beating the offside trap with timely runs, and the goal of the evening came when Jack Warmington eluded three tackles on the edge of the area and smashed the ball home in off the crossbar and post. The evening was completed right on time; Sam Dunkley found space on the right and he cut in and played a one-two with Luke Jones and then placed a shot over the keeper’s dive. Bragging rights to the Oranges who for most parts were the dominant team and another three points on the board. Rugby Town Youth have been drawn away to Nuneaton Griff in the Quarterfinal of the County Cup. The game will be played on Wednesday, December 13th at the Pingles Stadium with a KO of 7.45pm. The next league game is on Monday, December 4th when ninth-placed Redditch Utd Youth visit Kilsby Lane KO is at 7-45pm. Town Youth are currently second in the table on 19 points, just one behind leaders Alvechurch.